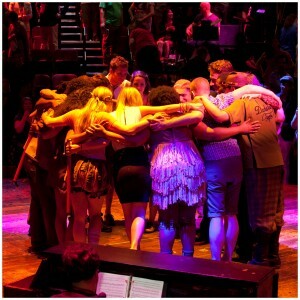 Last night Godspell played its final performance on the Broadway. The Circle in the Square Theatre was packed, with lots of friends and family in fine voice. The cast and band were also on fire, and the ovations (including a standing one in the middle of Act Two!) sustained and vigorous. After an emotionally charged curtain call, director Danny Goldstein stepped onstage for a heartfelt, gratitude-filled speech that included an inadvertant High School Musical reference. And then it was over. Photo by Jeremy Daniel. Stolen by me. At this time last year, I was already working feverishly on the arrangements – alternately exhilarated and terrified. This describes my customary rollercoaster of creativity/despair, so I knew it was going well. Except when I didn’t. And then did again. (Repeat until November 7.) Then we were in auditions all summer, which didn’t make the vocal arranging any easier, but there are a ton of ludicrously talented people in this city and we needed to see them all three times. Once we had assembled our brilliant, perfect, and (make no mistake) mentally ill cast, we launched into a quick and brutal rehearsal period – and I’ve said this before, but that was when musical director Charlie Alterman officially became one of my most favorite people on this planet. Then previews, then opening… and the reviews. Some were great (USA Today, Wall Street Journal), some not-so-hot (New York Times, and no, you don’t get a link), a few pans, and a whole bunch in between. (In the Not Taking Oneself Too Seriously Department, my Personal Prized Pullquote [PPP] came from the Hollywood Reporter: “What orchestrator Michael Holland does with those songs makes you question whether the creative team actually liked anything about Godspell when they took it on.” I mean, sure, it tells you more about the reviewer than the production – we changed some stuff, in case that wasn’t clear – but it’s funny! I’d hang with this guy – until he’d inevitably nod off.) Then came eight months of performances, the complete and total snubbing by the Tony nominating committee, and last night’s subsequent closing. But more work will come, as it always does. I sure hope that some of it involves any and all of the incredible folks I had the honor of getting to know this past year. Sure, I’m sad that we closed, but I’m glad we opened, and I’m even gladder that we ran. And I’m proud to have been a part of something that has touched so many people. Oh, and Frank DeMayo was at the show yesterday. You don’t know him, but he’s been looking for his name since the beginning of this entry, and that was it. This entry was posted in News and tagged broadway, cast, circle in the square, closing, godspell, michael holland. Bookmark the permalink.